I thought JK did a great job tonight. He is my new favorite sub. I was half hoping that we would all be wrong and I would turn on 360 to find AC's smiling face, but no such luck. The story on the fake FEMA press conference blows me away. Did they really think they could get away with that? What kind of rubes are running our government? Was the guy in charge (who just rightfully got canned) another recent grad from some tiny evangelical university whose daddy is a big contributor to the GOP? Yesterday was the first day we had blue skies here in L.A. News media are still reporting that the air is moderately unhealthy, but I no longer have a constant headache and swollen sinuses as I did from the smoke. It's been been rough, but I am grateful to live in an area that is not subject to wildfires. Just the occasional earthquake and constant traffic. I'm not really complaining. L.A. has its faults, but there are plenty of wonderful reasons to live here, including the best weather in the world, as far as I am concerned. Tonight's 360 it had a lot of good informative stories. Meat Recall! I don't think that it should take so long to alert the people about a product recall when someone buys something from the grocery store and gets e-coil poison. It taking 3 to 4 weeks to alert people is ridiculous. Whether or not the government should pay to have everyone's home in California rebuilt. I think the insurance companies should be made to pay. Anyone that lived in one of those homes and didn't have insurance there is something wrong. If the government pays to have those homes rebuilt they should pay to have everyone's homes rebuilt in the U.S. that's destroyed by fire. If a person cares about their property, home, cars, and so on, they will have insurance. Deadly fire kills 7 people at Ocean lsle, North Carolina. 13 young people goes for a weekend getaway to the beach 7 of them was killed by a house fire. The reason for the fire hasn't been determined yet. 6 of them went to "University Of South Carolina" in Columbia, South Carolina. The other one went to "Clemson University" in Anderson, South Carolina. It's a real sad time for all of us in South Carolina right now. I been to Clemson University. Ocean Isle, North Carolina, Is only a few miles from where I go in the summer time at Myrtle Beach, South Carolina for getaway. Obviously I am a terrible 360 fan.I didn't see one second of the show at all. 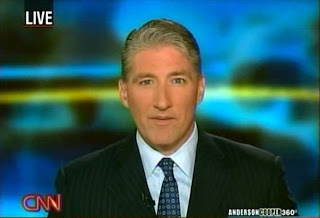 I really like John King and I think he does an excellent job filling in for Andy becuase he brings an energy to the show that AC just cannot bring. However as soon as I hear that AC is gone for the week I get all excited becuase that means I can finally catch up on my MTV shows. So that is why I am a bad 360 fan. Paul making a move is so cute to imagine. He was the highlight of the night along, of course, with John King. Thanks for catching me up on 360 and for giving me the night off Cyn. I can take or leave all of the subs, personally. 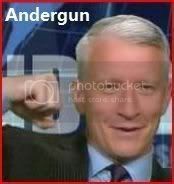 I like John King, but I don't see him bringing anything special to the program that Anderson doesn't already; they all have their own styles, but frankly, I prefer Anderson's; even when 360 isn't at its best, for me, he makes it watchable and it's NOT all about his looks, but just his unique style of reporting and his quirky and funny personality. 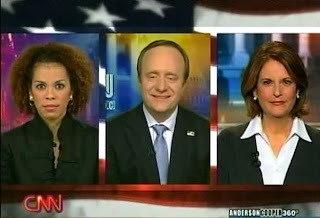 Hmm...I think it is interesting to see MW sit on the anchor chair of AC360. I don't know, I sort of like the gas can commercial. I think the cans are cute. I just see Michael Ware anchoring the show! Very colorful! AND where are my fellow Peter Bergen fans!?!?! I want to know who else out there thinks smart is hot! I knew AC was not going to be on so I did not watch the live hour at 9(cst my time). I did watch the 10pm cst and it was a good show. I like JK. He is no AC but I got my news right! I love JK so, of course, I thought last night was great. Wonder if he will be there all week? Paul is hilarious...he never pulls a punch! MM so glad everything is getting better down there. The weather is such a strange thing. Now those dreaded Santa Anna's that swooped down on you all from our high deserts have reversed and all the smoke is landing up here in the Rockies. We have had air quality warnings most of this week. Glad I don't have to go to the city this week because the air is bad enough in there already. Maybe it's just me but the segment on buying up homes and communities just seemed unrealistic. Where can you actually live in this country that you don't have some natural disaster every year. The West gets it wildfires, usually followed by flooding and mudslides. The Midwest gets it tornadoes. The gulf and east coasts deal with the hurricanes. And then, there are all of us who live on earthquake fault lines! Seems like there is a risk involved any where you go and telling people they can't live there seems unrealistic. Don't get me started on the insurance companies. The fact that most insurance companies experienced record gains the year following Katrina has to tell us something! I spent two glorious weeks in North Carolina this summer. Don't know if I loved the shore or the Smoky Mountains the best but the fire is such a tragedy. I could just imagine what a wonderful time the students were having . That is one of the great things there, you can rent a home close to the shore for a very reasonable cost. I feel so badly for the families that lost these young people. Losing your children has to be the worst thing I can imagine. No comment of FEMA except to say nothing surprises me anymore that comes out of the folks in D.C! I have new appreciation for what you guys do! I just covered last night's program over at johnthenewsking and it was a lot of work to break down the entire 360 show! Kudos to you all for doing this on a daily basis!! @ ACanderfan: bad girl! bad girl! OMG Cyn, you crack me up!!!! Okay, so I totally vote for MICHAEL WARE as sub! Wow, great idea! He is just the best. And Mavis - here I am (*waves hand in air vigourously*) completely attracted to smarts and brits! Peter Bergen ROCKS! Love him! His books are amazing! No one on earth knows Al Queda and Bin Laden better than Peter. Rock on! Assuming that AC will be out the whole week- I could handle John King subbing for the whole week. 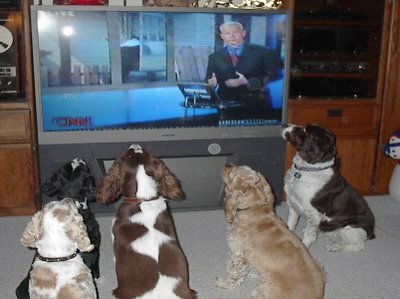 I thought last night's program was great. The remark that John King made about James Carville cracked me up. Great post Cyn! I've always wondered how many of the commercials that air are local versus national. For the longest time I was sure that the "Head On" (& everything else "On" these days) commercials had to be local- no way they could be running nation wide.